Andy Reid brings his 9-1 Chiefs to battle it out in a potential Super Bowl preview against Sean McVay and his 9-1 Rams in this NFL showcase game in the LA Coliseum. The game was previously scheduled at Azteca Stadium in Mexico City on Sunday Night, but had to be move to LA due to poor field conditions. 5Dimes has made the Rams a 3½ point favorite but the play is to take the Chiefs and the points. Here is the handicap. Why did sportsbooks have the Rams as 2 point favorites in this game when it was on a neutral field? The Chiefs hold the best ATS record in the league, and the Rams have not covered against the bookie in 5 of their last 6 games to sit under .500 ATS for the year. LA had a major injury in last week’s game with receiver Cooper Kupp being lost for the season, and Aquib Talib is still on the sidelines. Meanwhile, the Chiefs will be the healthiest they have been all season as they head to the city of angels. Justin Houston should be 100%, and their second best receiver Sammy Watkins is expected to back in action after missing last week’s game. Despite this, bettors have to pay sportsbooks a premium to side with the Rams. This line should have been a pick-em, as the teams are even, and the game was truly on a neutral site. Now the game is moved to LA and the Rams get an additional point and a half for home field. There will be more Chief fans in the LA Coliseum than Ram fans. Maybe they get something for being able to sleep in their own bed, but moving the line to more than a field goal with Chiefs is a gift. The Rams are 2-3 ATS at home this year so the Coliseum is not one of the NFL venues that teams fear going into, especially not the Chiefs who are 5-0 ATS on the road this season. It doesn’t take a Master’s Degree in Football to know that these 2 teams are going to light up the scoreboard. The total for the game sits at 64, which is the highest total of 2018, but who has the guts to play Under? The Chiefs are the 2nd highest scoring team in the league at 35 points per game, while the Rams are a close second scoring 33 per game. The teams are ranked first and second in yards per play and second and third in passing yards. If the strengths of the offenses aren’t enough to convince us this will be a track meet, the weaknesses of the defenses back it also. KC is allowing 24 points per game, which is only 1 point more than the Rams. Both defenses are bottom 10 in yards per play and the Chiefs have allowed the most passing yards in the league. The key stat that separates these teams and the only statistical blemish for the Rams is red zone efficiency. This is the chink in the Rams armor that may end up holding them back down the stretch. They are only scoring touchdowns on 56% of their trips to the red zone, good for only 16th in the league. The Chiefs are scoring touchdowns at a 71% clip, good enough for 6th in the league. In the Rams game against the Saints 2 weeks ago LA also struggled converting on third down, converting only 37% of third downs and also were 0 for 2 on 4th downs. 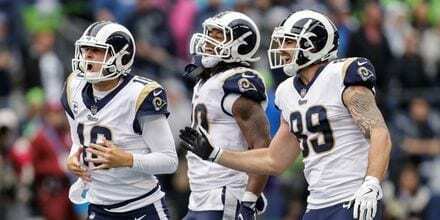 The Rams fill up the stat sheet and remind us of Greatest Show on Turf, but they are not converting when they need it most. The other big question is which quarterback will play better in the spotlight when a big play is needed. These are two of the best young QBs in the NFL, and how they play in the big games will define their careers. I believe the weapons around Patrick Mahomes will give him the better chance to shine on Monday. Look for the Chiefs and Mahomes to be the more efficient team on Monday night. These teams will have to score touchdowns to keep up, and the Rams are more likely to leave some points on the field. Kansas City’s defense has been heating up in the recent weeks, especially the pass rush. They rank second on the season with 31 sacks, including 12 in the last 3 weeks. Dee Ford is leading the way with 9 sacks, and Houston has 3 but has missed 5 games. He is back in the lineup after recovering from a hamstring injury. Kansas City has forced 5 turnovers in the last 4 games and only given up 68 points over that stretch after giving up 172 points over the first 6 games. The Rams on the other hand have given up 133 points over the past 3 weeks after only allowing only 98 points in their first 7 contests. When they played the Saints 2 weeks ago, Drew Brees led the Saints to 487 yards and 45 points, and the Saints had their way with the LA secondary. The Ram defense has 26 sacks on the year, but couldn’t get to Brees in the Saints game. The Rams linebackers have been a major liability and will be facing one of the best tight ends in the game in Travis Kelce and one of the most versatile running backs in Kareem Hunt. This game will be won by the offenses, but the Chiefs D is in better position to make a key stop and impact the game. Buckle up for what should be a classic NFL game. Take the 3½ points and play the Chiefs. What about the total? Who would have the guts to play over? The previous 2 highest totals on the year were Chiefs vs Patriots in week 6 with a total of 59, and Rams vs Saints in week 9 with a total of 57½. Both of those game produced 80 points. Play the Over.